Silky white sand dunes slumped earthwards harbour turquoise water in their shallow basins. Ahead, the scenery undulates as far as the eye can reach, creating the optical illusion of an endless mirage. Nearly 50 inches of annual rainfall pour into large pools. The impermeable layer of rock beneath the sand prevents the water from seeping through. Torrential rain and wind combined have created our planet’s largest coastal dune field, native to Brazil, with its outlandish sand scape resulting from a mere hundred years of erosion. 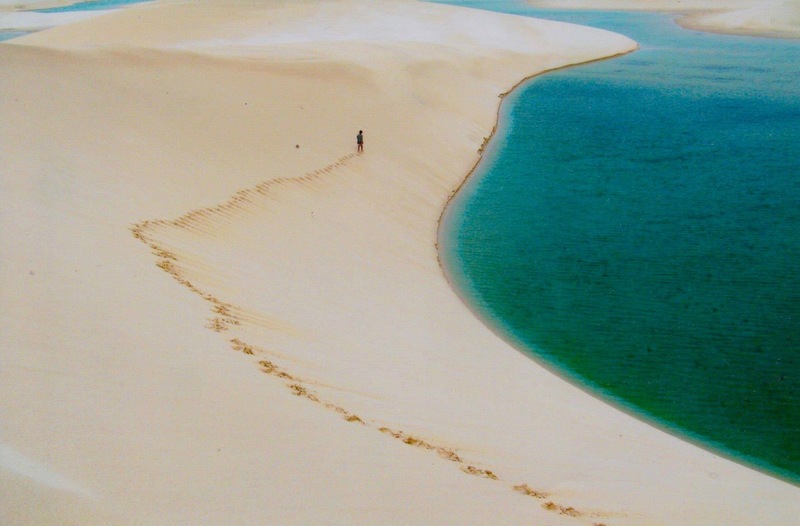 Lençóis Maranhenses, which translates into “Bedsheets of Maranhenses”, is a 600 square mile National park stretched over the tropical northeastern coast of Brazil. From a bird’s eye view, the landscape resembles a Picasso masterpiece of abstract nudes painted atop a baby blue canvas. The vast blankets of sand that came to settle here, have been transported through the drainage system of the local Parnaíba and Preguiças rivers. Sand and other material journey from the heart of the continent to this significant beach area spread along a 44-mile long shoreline. It is during the months of October and November that the torrential rains and heady winds work in unison to create this ecosystem. 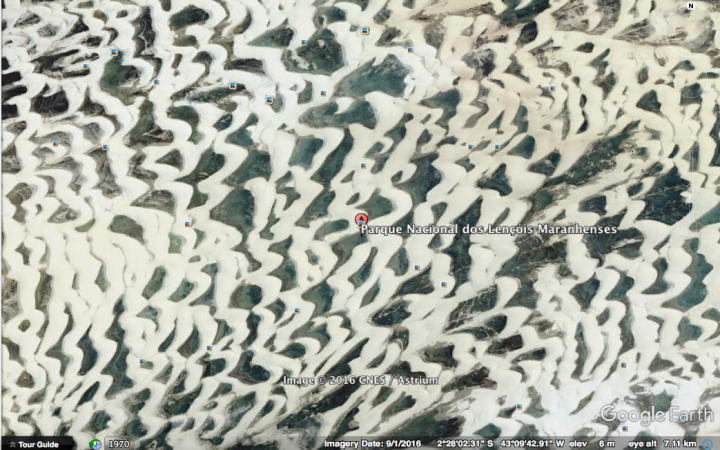 The wind disperses the sand 30 miles inland from the coast, sculpting pristine white tiger stripes in its wake. “These sand dunes are constantly moving with the wind” shares Carlos, a local resident who has kindly offered to show us around. Some dunes reach 130ft in height and advance as much as 65ft per year. 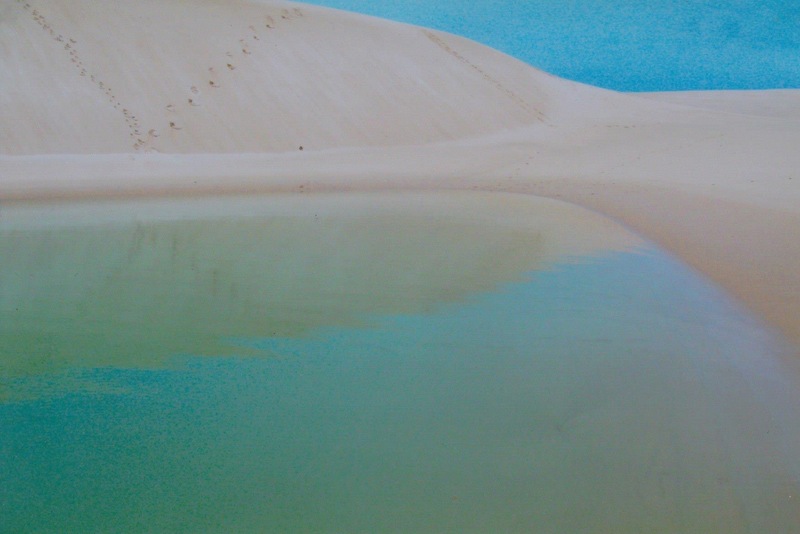 Rainfall fill pools to the rim from January till July, causing an overflow that interconnects the dunes by small streams. This enables fish to migrate and feed on larvae and insects, such as the wolffish, a dormant species that dwells beneath the mud. These pools can measure up to 300ft in length and stretch down to a depth of 10ft. Water reaches a temperature of 30˚C before it evaporates into the external heat, emptying the pools by 3ft per month. 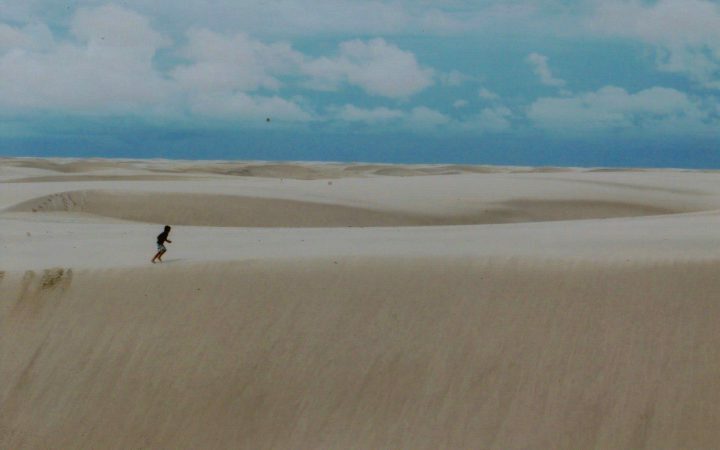 Small communities of no more than 100 locals are found inhabiting two oases in the dunes; Queimada dos Britos and Baiza Grande. They reside here during the rainy season, when vegetation thrives, allowing them to feed off their freshly grown produce. Their homes, palm-roofed huts, are camouflaged by the scarce vegetation, its growth is limited by the strong winds. Chickens and cattle range in their backyards while shepherds are spotted wandering herds of goats along the deserted dunes. This dune structure reaches the neighbouring town of Jericoacoara, where larger communities live and tourism operates on a bigger scale. The landscape undulates into the horizon, as far as the eye can reach. “These dunes were declared a national park in National,” adds Carlos. The park is now managed by the Brazilian Chico Mendes Institute for Conservation and Biodiversity (ICMBio). “Since then, regulations have been put in place to protect the fragile ecosystem, preventing certain vehicles from riding over the dunes”. Indeed, the ICMBio prohibits all vehicles from entering the park, with the sole exception of 4-wheel drives offering guided tours. In 2002 a highway was paved between capital of Maranhao, San Luis and Barreirinhas, which has led to a significant increase in tourism, inviting over 600 000 people to visit the park each year. It is wonder to behold, and with the ever changing global climate, who knows how this giant sculptural phenomenon will be moulded into in the future.